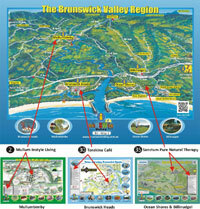 The original inhabitants of the Brunswick Valley were Aboriginal people from the Minjangbal Tribe. The Minjangbal people lived in the New Brighton and Ocean Shores areas where seafood and an abundance of wildlife provided a constant food supply. The Durrungbil people, who were part of the Minjanbal Tribe, lived at Brunswick Heads. These people were strong and healthy due to the plentiful food supply. They became known to the cedar-getters and continued to live in the area for many years after European settlement began. Captain Rous named the Brunswick River in 1828 but it was not until later that the first recorded settlement of Brunswick Heads took place. Steve King (a former convict) and the Boyd brothers set up camp and commenced logging for cedar along the banks of the Brunswick River in 1849. By the early 1850′s Brunswick Heads had become an established sea port for transporting cedar to Sydney. Also, as the banks of the Brunswick River were lined with an abundance of timber species well suited to boat-building and repair, a large boat-building industry developed at Brunswick Heads. As the cedar-getters and boat-builders made frequent trips up the river for materials, a camp site was established at the junction of the three arms of the Brunswick River. This grew to become a village and later the township of Mullumbimby. It was an excellent site because the river was tidal and could be easily navigated to that point, its central location gave access to all areas of the catchment area and it provided the best position for bullock teams to cross the river with their wagons loaded with timber. Early pioneers used Brunswick Heads as a port until the Byron Bay Jetty was opened in 1888. 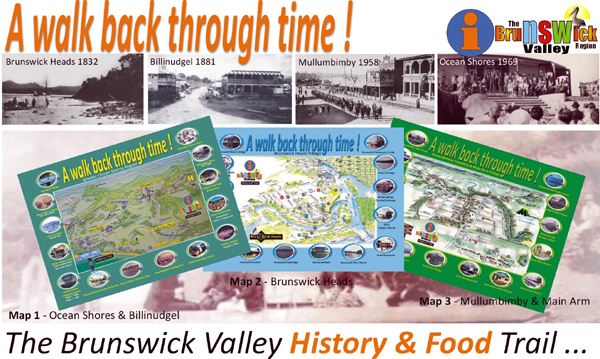 The Brunswick River remained an important link to other centres by providing quick access to the sea for small boats and schooners which transported supplies to and from neighbouring townships such as Mullumbimby, Burringbar, Murwillumbah, Byron Bay and Tweed Heads. History courtesy of Mr Frank Mills, Ocean Shores.